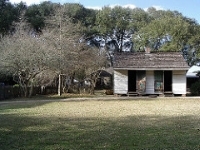 Situated on the Burden Research Plantation, run by the Louisiana State University, is the Rural Life Museum and Windrush Gardens. The museum features an extensive collection of tools, household utensils, furniture, vehicles and farming implements, some outdoors and others housed in some 32 historic buildings that depict the lifestyle of pre-industrial 19th-century Louisiana. Once you're finished reliving the past, take a stroll through the Windrush Gardens, which are spread over 25 acres and feature majestic oaks and ancient crape myrtles. The Rural Life Museum is set in very pretty grounds and is a popular wedding venue.